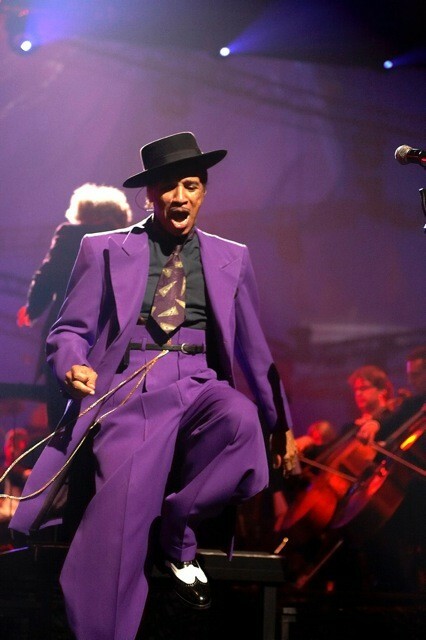 KID CREOLE AND THE COCONUTS RETURN TO THE BARBICAN IN LONDON ON OCTOBER 7TH! The Barbican hosts an evening of music drawn from life and times of American artist Basquiat featuring Kid Creole & the Coconuts and Arto Lindsay. Both musicians inhabited the same cultural sphere as Basquiat, namely the New York of the 70s and 80s. This concert will feature the heady concoction of influences running from jazz to disco via numerous subcultures of punk and no wave – sounds that intertwined, unravelled and cross-pollinated during this exceptionally creative period. The musical languages of both Kid Creole and Arto Lindsay also draw further multicultural parallels to Basquait given their shared Caribbean and Latin American heritages. Kid Creole a.k.a. Bronx-born and raised August Darnell and his big band, the Coconuts, returns to the Barbican for the first time since 2010 with a selection of hits from the back catalogue. No Wave legend, New York icon Arto Lindsay also returns to the Barbican to present a new chapter of his genre-defying music career: the new album Cuidado Madame, mixing pop, noise and Brazilian reminiscences. Additionally DJ Justin Strauss joins the evening’s line-up. A former resident at NYC’s infamous Mudd Club, Strauss soundtracked nights when Basquiat, Kid Creole and Arto Linsday took to the dancefloor. Strauss’ DJ set at the Barbican will further invoke the Basquiat era by recreating the vibe of Mudd Club and other Lower Manhattan haunts such as Area and Negril.